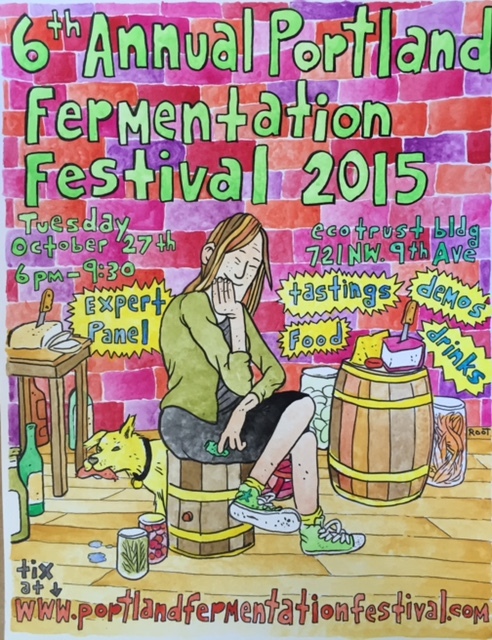 The 6th annual Portland Fermentation Festival takes place Tuesday, 27 October 2015, at Ecotrust’s Billy Frank Jr. Conference Center (721 NW 9th) from 6 PM to 9:30 PM. .
Bring your own homemade fermented foods – everyone can share. Nothing at this food fest is for sale – it’s all about sharing tastes, and knowledge. Plus there are doors prizes, give-aways and Fermentation Festival souvenirs! Sample pickles, sauerkraut, kefir, kimchi, miso, and more from 30 different amateur and professional fermenters! On the rooftop enjoy beer, hard cider, and Bingo Sandwiches. Admission is $10 for the 7 PM to 8 PM tasting sessions, or $20 for the session plus the 6 PM expert panel tasting – visit the Portland Fermentation Festival website for advance ticket information. Local food writer Liz Crain, co-organizer of the festival with George Winborn and David Barber, shares more details and highlights of the 2011 event at Food Lover’s Guide to Portland. There’s a nice review of the 2014 event at Cooking up a Story.